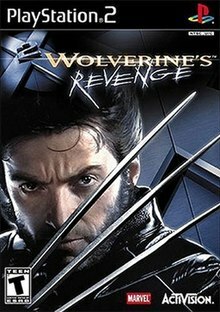 X2: Wolverine's Revenge (released as X-Men 2: Wolverine's Revenge in Europe) is an action video game released in 2003 for the GameCube, PlayStation 2, Xbox, Windows, and Game Boy Advance to coincide with the release date of the film X2, developed by British game developer GenePool Software and published by Activision. The Game Boy Advance version was also released on a Twin Pack cartridge bundled with Spider-Man: Mysterio's Menace in 2005. The game was released as a promotional tie-in to X2 but featured an original story by famed comic book writer Larry Hama, and does not take place in the continuity of the film series, but had a closer resemblance to the Marvel Universe instead. In X2: Wolverine's Revenge, the player helps Wolverine fight his way past the heavily guarded areas of the Weapon X Facility to piece together fragmented clues to Wolverine's murky past and to save his life. Wolverine has 48 hours to find an antidote to the deadly Shiva Virus circulating in his bloodstream and the clues point to the Weapon X facility, the Canadian fortress where he had his skeletal structure fused with adamantium. A significant feature has Mark Hamill providing the voice-over for Wolverine in game. While Hugh Jackman's likeness is on the cover and promotional material, the character model in game is based on the comic books. Patrick Stewart reprises his film role as Professor X in game. The game received generally mixed reviews upon release, with reviewers praising the voice acting, especially of Hamill and Stewart, and unlockables, while criticising the slow combat, lack of mid-level checkpoints, and for being too hard and requiring too many retries. It was also the only console game focused on Wolverine until X-Men Origins: Wolverine six years later. The action is played from a third-person perspective as players fight a number of armored soldiers, mutant creatures, and archenemies such as Sabretooth, Magneto, Wendigo, Lady Deathstrike, and Juggernaut. While Professor X is able to assist Wolverine with powers of telepathy, the surly comic book hero must ultimately carry out his adventure alone. To that end, players must tap into Wolverine's unique talents to overcome all manner of obstacles. Wolverine will be able to hunt and track his prey using his heightened sense of smell and ability to detect body heat. As Wolverine makes his way through the military compounds, he will need to avoid defense systems and guards, and find ways into locked rooms to discover the information he needs to survive. When engaged in combat, Wolverine can retract and release his adamantium claws at any time to perform slashing attacks, aerial combos, and a number of different throws. The strike moves used in battle are the Combat Strike Moves, which initiate a short cut-scene where Wolverine attacks the enemy. In addition to Combat Strikes, there are special Stealth Strikes, Situation-Specific Strikes and Boss-Specific Strikes which become available at certain points in the game. Stealth Strikes are used to take out enemies silently. For example, Wolverine can do a wall-hug to creep up on an enemy and stab him before he can sound the alarm. Wolverine's unusual healing ability allows him to withstand punishment that would kill an average human being, but he can become wounded over time. Sustaining major injuries triggers a feral rage, imbuing Wolverine with greater strength and the ferocity to take on multiple foes at once. The story begins in 1968. Logan (Mark Hamill) is walking along a backstreet, when behind him come some agents from the Weapon X program. They try to capture Logan so they can take him to the Weapon X facility. Logan tries to defend himself, but he is shot with a tranquilizer dart and knocked unconscious. Logan is taken to the Facility and subjected to the adamantium bonding process. Soon after, he escapes from the experiment chamber and tries to get outside. The Professor (Don Morrow) calls him an animal, which enrages Logan and helps him escape the Professor's control. Logan tries to get to The Professor to confront him but he is stopped by Sabretooth (Fred Tatasciore). He defeats Sabretooth and he confronts The Professor while telling Dr. Abraham Cornelius (Don Morrow) and Dr. Carol Hines (Jennifer Hale) to take their leave. When Weapon X restrains him at claw-point, The Professor reveals that all Weapon X subjects were implanted with a dormant and deadly virus known as the "Shiva Strain" as a failsafe. The Professor also reveals that the virus would kill a normal human in one year but has no idea how long the virus would kill a human mutant. Later in the present, Logan, who now goes by "Wolverine", is now a member of the X-Men and he has told Beast (Richard Portnow) what he remembers of his past. Beast tells Wolverine that the Shiva Virus has bypassed his healing factor and will kill him in two days if the cure is not found (ironically, which is on Logan's birthday). Professor X (Patrick Stewart) tells Wolverine to try to find the cure in the Weapon X Facility while Beast provides Wolverine with an implanted wristwatch telling him how much time he has left. After being flown to Edmonton by Cyclops and Jean Grey, Wolverine uses a private plane flown by a female pilot (Mayim Bialik) to get to the Weapon X Facility. However, the plane is shot down. He survives the plane crash and starts making his way towards the Weapon X facility. Wolverine fights his way to a cavern where the spirit of the Wendigo (Frank Welker) lives. Wolverine fights with Wendigo and wins. Wendigo gets up and throws Logan out of the cavern where he lands on snow. Logan sees a Weapon X truck and jumps on it. Logan reaches the Weapon X Facility and sneaks in. On the way in, he is ambushed by a group of GIs. The sound of gunfire starts and Wolverine is surprised that he is not shot. He then sees another GI who shot down the ambushers. When Wolverine asks him why he let him live by asking "Am I supposed to thank you, or are you just a lousy shot? ", the GI states, "Lets just say it's not your time to die...yet." Wolverine examines him a moment and he asks "You're not quite human, are you?" To which the GI states, "You should talk." As he walks away. After fighting through the base, he accesses a database and finds that the Weapon X scientists are at the Void (a maximum security mutant detention center that's similar to the Vault) so he makes his way there. Leaving, he is attacked by Sabretooth again. Sabretooth is defeated and grudgingly gives Wolverine the Part B of the virus cure after stating that he knew about the Shiva Virus a long time ago. Later, Logan goes to The Void where he sees Colossus (Ted Nordblum) who lets him enter the facility after he was informed by Professor X about Logan's condition. While Logan is fighting his way on the Facility, Sabretooth comes to the Void and takes out some of its security on his way to get to the Weapon X scientists. Sabretooth then releases Alpha-Class mutants Omega Red, Magneto, and Juggernaut from their prisons. Meanwhile, Logan finds Dr. Abraham Cornelius and Dr. Carol Hines. Abraham Cornelius gives Logan the formula of Part A of the cure. Due to the Void blocking Logan's contact with Professor X, he ends up having to head outside to relay the info to him. Upon leaving, he warns Abraham Cornelius and Carol Hines that Sabretooth is also looking for them. However, when Logan reaches the roof, he is faced by Juggernaut (Fred Tatasciore). When Logan defeats him, Colossus tells Wolverine that Magneto and Omega Red were the other two Alpha-Class mutants that were freed. As Colossus drags the unconscious Juggernaut back to his cell, he points to the device that will help Logan get out. Logan destroys the Void Shield and relays the info of the Part A cure to Professor X after being told that Beast has synthesized the Part B of the Shiva Virus cure. Logan then heads out to find and defeat Magneto after Professor X detects magnetic signatures. After Logan escapes, May Deuce (Mayim Bialik) the Mutant Hunter Boss comes to the Void to lead the Mutant Hunters into hunting down Wolverine and the other escaped mutants. While looking for Magneto, Logan is contacted by Professor X stating that the Magnetic Flux Limiter Collar on him has suppressed Magneto's magnetic powers long enough for him to become more powerful. Logan comes across a ruined highway and uses a motorcycle which he rides into a ruined town. Logan manages to find Magneto (Fred Tatasciore) in a steel mill. Logan tries to stop Magneto's moves, but he has to kill all the Mutant Hunters at the same time. Logan defeats Magneto and knocks him unconscious. Upon being told by Professor X that too much magnetic interference is preventing Rogue from homing in on him, Logan then makes his way to the city leaving Magneto for any Mutant Hunters sent from the Void. When Logan is heading to the city to meet up with Rogue, a helicopter comes to him. In the helicopter is May Deuce. She thanks Logan because he defeated Magneto and offers to take him to the top of the Xenon Building. But when the helicopter reaches the top of a building, May Deuce throws Wolverine on the roof. Logan sees Lady Deathstrike (Gwendoline Yeo) and he realizes that the pilot, the Army GI, and May Deuce were some of Lady Deathstrike's robots who were to direct Wolverine to her so she could kill him. She also revealed that she paid Sabretooth to cause him pain. Wolverine defeats Lady Deathstrike and reaches a helicopter land platform where she follows him. Logan throws Lady Deathstrike off the roof and Rogue comes with the virus cure. Wolverine drinks it and goes home. Sabretooth finds Lady Deathstrike. He takes a vial from her and drinks it (most likely the cure for the virus), takes her, and leaves. Meanwhile, Apocalypse (Christopher Corey Smith) and Mister Sinister (also Christopher Corey Smith) watch every move from Wolverine as they prepare their Horsemen of Apocalypse. Wolverine lies on his bed and then suddenly realizes that he has not found and defeated Omega Red upon remembering the escaped mutants that Colossus told him about. In all versions (except for the Game Boy Advance version) if the player collects all dog tags, a deleted scene is unlocked. As Wolverine visits a ruined town to find and defeat Magneto, he is stalked by a shadowy figure. As the figure gets close, Wolverine nearly kills the figure who is revealed to be Spider-Man (Rino Romano). When Wolverine states that Spider-Man is off his home turf, Spider-Man sarcastically explains that he heard about the big breakout down at the Void and rode a charter bus with other superheroes who could not fly or teleport. When Spider-Man asks if Wolverine needs help battling Magneto, Wolverine tells him to deal with the chaos until Damage Control arrives as he goes to battle Magneto. X2: Wolverine's Revenge was met with average to mixed reviews upon release. GameRankings gave it a score of 67.25% for the GameCube version; 61.79% for the PlayStation 2 version; 76.67% for the GBA version; 60.83% for the PC version; and 65.07% for the Xbox version. Likewise, Metacritic gave it a score of 62 out of 100 for the GameCube version; 58 out of 100 each for the PS2 and Xbox versions; 72 out of 100 for the GBA version; and 55 out of 100 for the PC version. Common criticisms include clunky and alienating stealth mechanics, bland visuals, and high and unforgiving difficulty, making the game unfairly hard. Official UK PlayStation 2 Magazine gave the game 7 out of 10, describing it as follows: "a quality action adventure that blends stealth with hand-to-hand combat. Only a few irritations deny this a higher score." Of the said irritations, the most prominently criticized element was the lack of mid-mission checkpoints, forcing players to replay large sections upon death. Maxim gave the game a score of eight out of ten and said, "While most of Revenge’s game play involves turning bad guys into kebab, the game’s strict homage to the comic gives it more depth." The Village Voice gave the Xbox version a score of seven out of ten and said, "Deploying your special powers is motivation enough to move through the game's booby-trapped military complexes, crash sites, mines, caves, and places that look like mines or caves." The Cincinnati Enquirer also gave it three-and-a-half stars out of five and stated that "Controlling Wolverine during combat can prove difficult, especially when there are multiple enemies onscreen simultaneously." However, Entertainment Weekly gave it a C− and stated that "The pacing is sluggish, the gameplay irritating, and ultimately it feels like Wolverine is exacting revenge on the wrong person: the player." ^ "2 in 1 Game Pack: Spider-Man: Mysterio's Menace / X2: Wolverine's Revenge (GBA) - Mobygames". Moby Games. WildKard. October 27, 2007. Retrieved January 13, 2016. ^ Marriott, Scott Alan. "X2: Wolverine's Revenge (GBA) - Review". AllGame. Archived from the original on 2014-11-18. Retrieved 2014-11-18. ^ Marriott, Scott Alan. "X2: Wolverine's Revenge (PS2) - Review". AllGame. Archived from the original on 2014-11-18. Retrieved 2014-11-18. ^ Bramwell, Tom (2003-04-30). "X-Men 2: Wolverine's Revenge Review (PS2)". Eurogamer. Retrieved 2014-04-09. ^ "X2: Wolverine's Revenge". Famitsu. 815. July 30, 2004. ^ Mason, Lisa (June 2003). "X2: Wolverine's Revenge (GC)". Game Informer (122): 109. Archived from the original on 2008-02-12. Retrieved 2014-04-08. ^ "X2: Wolverine's Revenge (PS2)". Game Informer (122): 104. June 2003. ^ Helgeson, Matt (June 2003). "X2: Wolverine's Revenge (Xbox)". Game Informer (122): 112. Archived from the original on 2007-05-28. Retrieved 2014-04-08. ^ Dan Elektro (2003-04-17). "X2: Wolverine's Revenge Review for PS2 on GamePro.com". GamePro. Archived from the original on 2005-04-09. Retrieved 2014-04-09. ^ Pong Sifu (2003-04-17). "X2: Wolverine's Revenge Review for Xbox on GamePro.com". GamePro. Archived from the original on 2005-02-04. Retrieved 2014-04-09. ^ a b c Silverman, Ben (April 2003). "X2: Wolverine's Revenge Review". Game Revolution. Retrieved 2014-04-09. ^ a b c Davis, Ryan (2003-04-21). "X2: Wolverine's Revenge Review". GameSpot. Retrieved 2014-04-08. ^ Davis, Ryan (2003-04-21). "X2: Wolverine's Revenge Review (PC)". GameSpot. Retrieved 2014-04-08. ^ a b c Williams, Bryn (2003-04-16). "GameSpy: X2: Wolverine's Revenge". GameSpy. Retrieved 2014-04-09. ^ Rausch, Allen (2003-04-18). "GameSpy: X2: Wolverine's Revenge (PC)". GameSpy. Retrieved 2014-04-09. ^ Zacarias, Eduardo (2003-04-29). "X2 Wolverine's Revenge - GBA - Review". GameZone. Archived from the original on 2009-02-02. Retrieved 2014-04-09. ^ Bedigian, Louis (2003-05-11). "X2 Wolverine's Revenge - GC - Review". GameZone. Archived from the original on 2008-09-27. Retrieved 2014-04-09. ^ Raymond, Justin (2003-06-01). "X2 Wolverine's Revenge - PC - Review". GameZone. Archived from the original on 2009-02-21. Retrieved 2014-04-09. ^ Watkins, Rob (2003-05-28). "X2 Wolverine's Revenge - PS2 - Review". GameZone. Archived from the original on 2009-04-18. Retrieved 2014-04-09. ^ Knutson, Michael (2003-05-15). "X2 Wolverine's Revenge - XB - Review". GameZone. Archived from the original on 2008-09-27. Retrieved 2014-04-09. ^ Harris, Craig (2003-04-16). "X2: Wolverine's Revenge (GBA)". IGN. Retrieved 2014-04-08. ^ a b Goldstein, Hilary (2003-04-16). "X2: Wolverine's Revenge (GCN, Xbox)". IGN. Archived from the original on 2008-07-03. Retrieved 2014-04-08. ^ Deez, Ivan (2003-04-16). "X2: Wolverine's Revenge (PC)". IGN. Retrieved 2014-04-08. ^ Dunham, Jeremy (2003-04-16). "X2: Wolverine's Revenge Review (PS2)". IGN. Archived from the original on 2008-10-08. Retrieved 2014-04-08. ^ "X2: Wolverine's Revenge (GBA)". Nintendo Power. 168: 140. May 2003. ^ "X2: Wolverine's Revenge (GC)". Nintendo Power. 169: 135. June 2003. ^ a b "X2: Wolverine's Revenge". Official U.S. PlayStation Magazine: 108. June 2003. Archived from the original on 2004-04-07. Retrieved 2014-04-09. ^ "X2: Wolverine's Revenge". Official Xbox Magazine: 78. July 2003. ^ "X2: Wolverine's Revenge". PC Gamer: 90. July 2003. ^ a b c d e Saltzman, Marc (2003-05-13). "Razor-sharp fun with Wolverine's Revenge". The Cincinnati Enquirer. Archived from the original on 2008-10-12. Retrieved 2014-04-08. ^ a b c d Keighley, Geoff (2003-05-02). "X2 Wolverine's Revenge Review". Entertainment Weekly (708): 79. Retrieved 2015-02-28. ^ a b "X2: Wolverine's Revenge for Game Boy Advance". GameRankings. Retrieved 2014-04-08. ^ a b "X2: Wolverine's Revenge for GameCube". GameRankings. Retrieved 2014-04-08. ^ a b "X2: Wolverine's Revenge for PC". GameRankings. Retrieved 2014-04-08. ^ a b "X2: Wolverine's Revenge for PlayStation 2". GameRankings. Retrieved 2014-04-08. ^ a b "X2: Wolverine's Revenge for Xbox". GameRankings. Retrieved 2014-04-08. ^ a b "X2: Wolverine's Revenge Critic Reviews for Game Boy Advance". Metacritic. Retrieved 2014-04-08. ^ a b "X2: Wolverine's Revenge Critic Reviews for GameCube". Metacritic. Retrieved 2014-04-08. ^ a b "X2: Wolverine's Revenge Critic Reviews for PC". Metacritic. Retrieved 2014-04-08. ^ a b "X2: Wolverine's Revenge Critic Reviews for PlayStation 2". Metacritic. Retrieved 2014-04-08. ^ a b "X2: Wolverine's Revenge Critic Reviews for Xbox". Metacritic. Retrieved 2014-04-08. ^ Boyce, Ryan (2003-04-16). "X2: Wolverine's Revenge". Maxim. Archived from the original on 2003-12-16. Retrieved 2014-11-18. ^ Catucci, Nick (2003-05-20). "Be the Game". The Village Voice. Retrieved 2014-04-08.